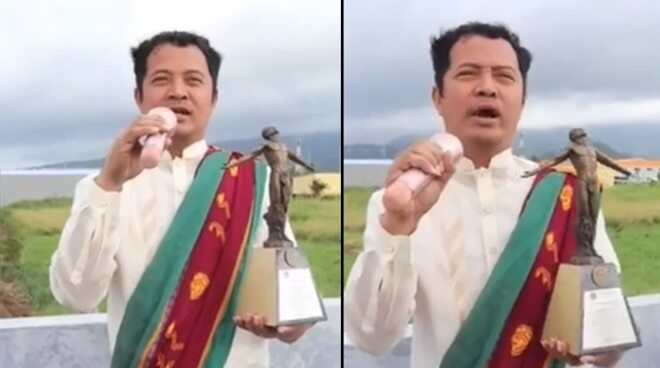 The witty professor even donned on a Barong Tagalog and the university’s Sablay to be in character for the video. Days before the much-awaited Game 2 of the 2018 UAAP Men’s Basketball Finals between University of the Philippines and Ateneo de Manila University, a UP professor made waves on social media for showing support to the Fighting Maroons in the most hilarious way. Donning on a Barong Tagalog and the university’s iconic Sablay, Professor Elmer Rufo schooled his fellow isko and iskas on how to properly cheer for the UP Men’s Basketball Team for their second do-or-die match that was held last yesterday, December 5. “Unang una sa lahat, ‘pagpasok ng UP Men’s Basketball Team, sumigaw tayo ng ‘UP Fight!’, ‘UP Fight!’. Yun lamang po ang isisigaw natin. ‘Wag tayong sisigaw ng ‘gwapo’ o kaya ‘macho’. Baka kiligin ang mga players natin, ma-in love pa sa inyo. Walang puwang sa sports ang pag-ibig, tsaka na ‘yun kapag nanalo tayo,” spoke Rufo on his pink microphone. The professor also reminded his students to only cheer if the ball is in the hands of their team. “Pero kapag bola ng kalaban, ‘wag tayong sisigaw ng ‘shoot that ball’ baka mamaya, ma-shoot ng kalaban. Hindi pwedeng magkapuntos sila. Kapag bola ng kalaban, ang isisigaw natin, ‘get that ball’. Hindi, ‘get his ball’ o kaya ‘get their balls’. Wala po tayong pakielam sa mga balls nila,” said Rufo. The same rule applies during timeouts. “‘Pag-time out, ‘wag kayong magchi-cheer. Dahil ang bola, wala sa atin, nasa referee. ‘Pag nag-cheer tayo baka maglaro ang mga referees. Baka sila pa ang manalo. Ang laban naman ay UP versus AdMU, hindi UP versus AdMU vs referee,” exclaimed the professor. Rufo’s last note was for fans and the UP Community to share the video, in the hopes that it’ll reach the team, particularly team captain Paul Desiderio and Juan Gomez De Liano, who has just been named as part of UAAP’s The Mythical Five. “Malay niyo, ‘pag victory party nila, invited nila ako. ‘Pag invited ako, invite ko rin kayo. Sama sama tayo doon. Yun lamang po at magkita kita tayo sa victory party,” finished the professor. As much as this lifted the spirits of both the Fighting Maroons and the rest of the UP Community, however, it was the Ateneo Blue Eagles still who successfully bagged the UAAP Season 81 title with a score of 99-81. Moreover, the team’s Thirdy Ravena was once again named Most Valuable Player of this year after having secured their win with his historical 38 points for the game.